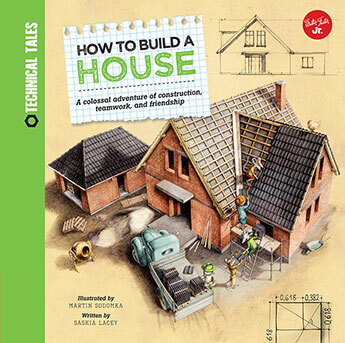 Filled with detailed, real-world diagrams, How to Build a House provides children with an introduction to basic home construction and the values of teamwork. Learn about home construction and teamwork as three unlikely friend work together to build a miniature house! How to Build a House continues to follow the adventures of the three unlikely friends--Eli, Phoebe, and Hank, as they take on their latest engineering adventure, building a house! Follow the trio as they learn about how a house is constructed, from the foundation to the rafters. Detailed diagrams and illustrations help children and their parents visualize and conceptualize real-world home construction. Through hard work and preservation, the three friends learn the ins and outs of architecture and the benefits of teamwork. Filled with high-tech, realistic diagrams, How to Build a House provides children with a basic introduction to how a home is built from the ground up and encourages their curiosity to dream big. A beautiful storyteller, Saskia Lacey is an educational children's author with an extensive teaching background. Lacey has developed engaging children's stories and projects for a variety of publishers and illustrators.Martin Sodomka is a graphic designer based in the Czech Republic. He is a self-published illustrator of books for children.